Over the past century, the Earth’s surface temperature has been increasing. This is primarily the cause of greenhouse effects. However, there exist many other factors, which influence the overall increase of the Earth’s surface temperature, which in turn, affects other organisms. These causes can be categorized into two main sections: human disturbances and the effects caused by the nature. Human disturbances include urbanization, deforestation, discharges from power plants and wastewater treatment facilities, global warming, and damming. A study showed that the most rapid rates of increase in temperature were located in downstream urban areas. Another example of human disturbance would be heating soil (timber harvest blocks). Although a few studies have shown that heating soil near stream would increase temperature of the river, more research is needed to quantify this impact more accurately. These human causes not only affect temperatures of water, but they may also affect air temperatures. But, an increase in the atmospheric temperatures is not only due to human disturbances. Another factor that affects an increase in air temperatures is the solar radiation. Due to the solar radiation and the resulting heat exchange processes that take place at the water surface, air temperature and water temperature are closely correlated. For example, the Hudson River’s increase in historical water temperatures coincided with increases in historical air temperatures. Other than human factors, other factors that affect water temperatures include water depth, flow velocity, and snowmelt may also play an important role in affecting water temperatures. Also, stream discharge, which is the inflows and outflows of a river, has an effect on the heating capacity (volume of water). Therefore, small streams have shown to be more vulnerable to increase in temperature since they have low thermal capacity. Another factor that affects water temperature is the size of a body of water. A study shows that daily variations of water temperatures are generally small for cold headwater streams but increase as streams get larger in size because bigger streams become less dominated by groundwater and are more exposed to meteorological conditions (the mean daily water temperature increases in a downstream direction, and water temperature is generally close to the groundwater temperature at source). The overall increase in water temperatures have huge significance on community biodiversity, especially on organisms habituating in water such as freshwater fish. Freshwater fish are the most sensitive to temperature changes since they are ectothermic animals: their metabolism, behavior, and development and growth all depend on temperature. Also, temperature would affect fish species because fish have specific thermal niche preferences, and each fish would choose thermal habitats that would give them the maximum growth rate and other factors such as reproduction. Hence, increase in water temperature may cause local species extinctions. Increase in water temperatures may cause other consequences as well. For example, it can alter stream metabolism, rates of nutrient cycling, and reduction of dissolved oxygen concentrations, along with increased toxicity of certain environmental contaminants. In order to reduce the effect of temperature changes, a reduction in greenhouse-gas emissions is necessary. Also, increasing urban trees, shaded stormwater retention wetlands may provide the buffer for the potentially harmful temperature surges in small streams; a decrease in water withdrawals by improving conservation measures can alternately reduce increase in water temperatures. Moreover, reusing treated wastewater may also reduce effluent volumes and temperature of waters. More significance of water temperature can be found in the following link: http://ga.water.usgs.gov/edu/temperature.html. Bussion, L; Blanc, L; Grenouillet, G. Modelling stream fish species distribution in a river network: the relative effects of temperature versus physical factors. Ecology Of Freshwater Fish 2008, 17, 244-257. Caissie, D. The thermal regime of rivers: a review. Freshwater Biology 2006, 51, 1389-1406. 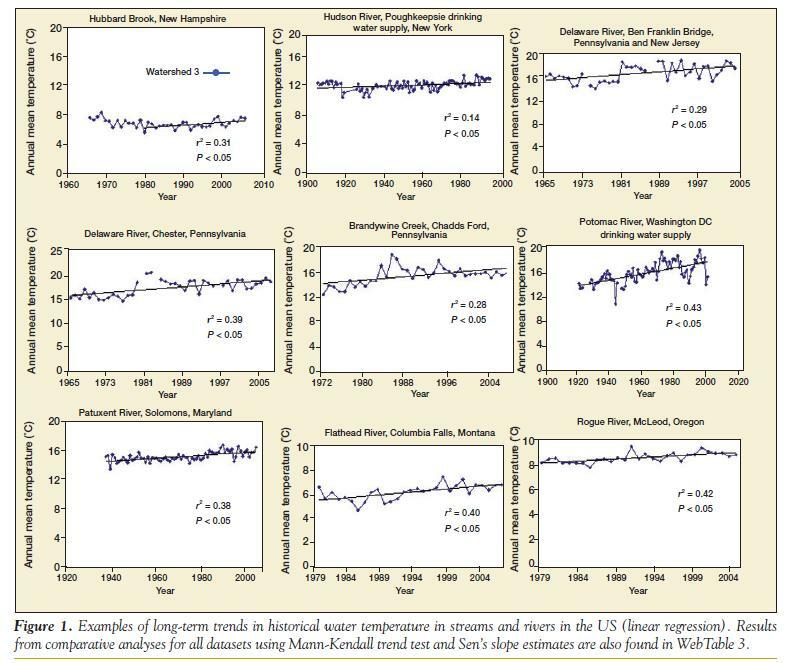 Kaushal, S; Likens, G; Jaworski, N; Pace, M; Sides, A; Seekell, D; Belt, K; Secor, D; Wingate, R. Rising stream and river temperatures in the United States. Research Communications 2010, 8(9), 416-466. Perlman, H. Water properties: Temperature. Water Science for School. [Online] 2011, Article Archive. http://ga.water.usgs.gov/edu/temperature.html (accessed Nov 22, 2011). Perlman, H. Water properties: Dissolved oxygen. Water Science for Schools. [Online] 2011, Article Archive. http://ga.water.usgs.gov/edu/dissolvedoxygen.html (accessed Nov 22, 2011). Webb, B; Hannah, D; Moore, D; Brown, L; Nobilis, Franz. 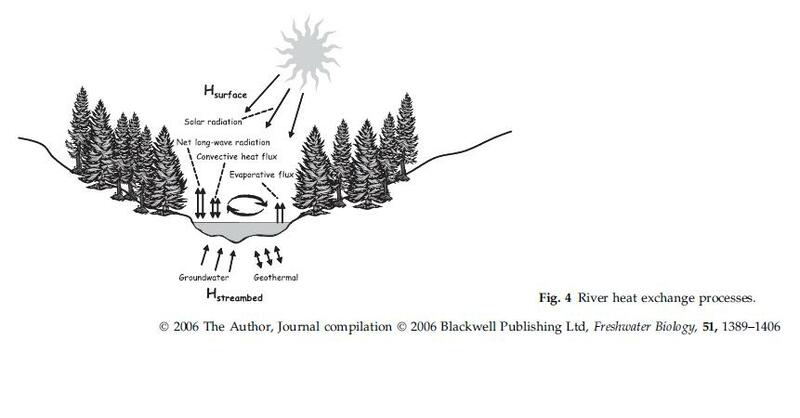 Recent advances in stream and river temperature research. Hydrological Processes 2008, 22, 902-918.